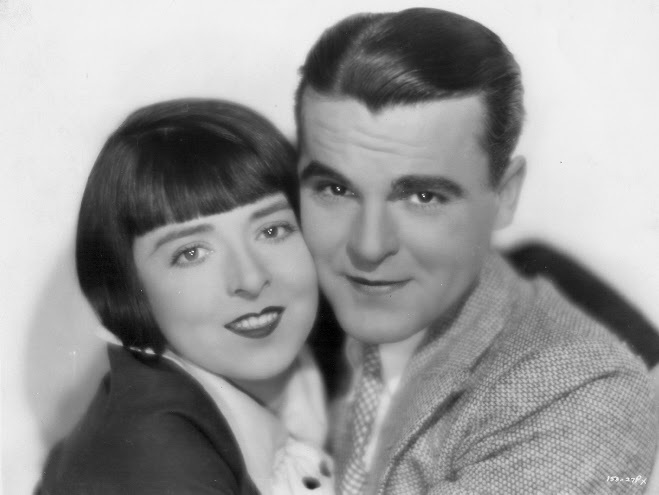 Colleen Moore and Neil Hamilton from Why Be Good? 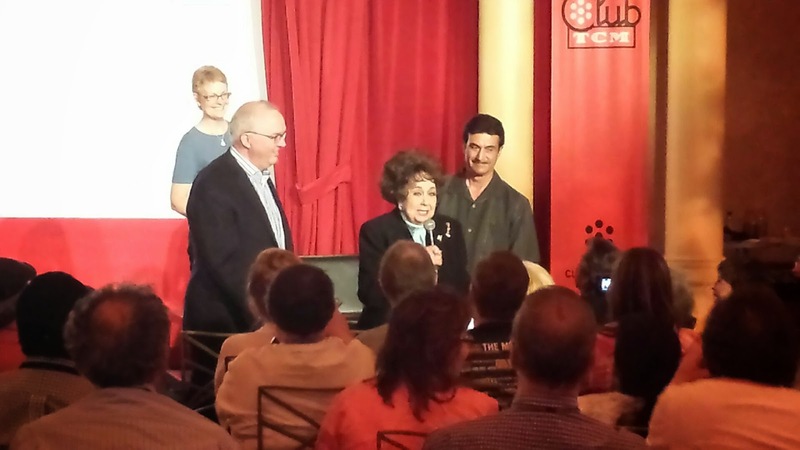 The third day of the TCM Film Festival and I felt like a “seasoned campaigner,” to quote Jean Dixon from My Man Godfrey, a film from the festival’s first day. There were some great movies screening in the morning, but again, I opted to see things I hadn’t seen before, including another silent movie, a Disney classic, an early John Ford melodrama featuring Ralph Bellamy—in the lead—Pat O’Brien and Gloria Stewart, a Preston Sturges classic, a glossy melodrama from director Douglas Sirk, and some Hollywood home movies. First up was the silent film Why Be Good? (1929) starring Colleen Moore and Neil Hamilton. Cari Beauchamp, an award-winning writer and documentary filmmaker introduced the film. We learned that the movie was thought to be lost, but that a print was discovered in Italy in the late 90s and eventually restored. The movie is about a young flapper, Pert—love that name—Kelly (Moore) who pretends to be a bad girl so she can go clubbing with her fast friends. Pert loves to dance and have fun, but she is strictly a “good girl.” The action begins when she meets a young man at a club after she ditches her lech of a date, when he falls asleep in a drunken stupor. As she is about to leave, she meets Winthrop Peabody Jr. (Hamilton). They are immediately smitten and Winthrop asks her out on a date for the following evening. Pert, tired from the late-night out with Winthrop, arrives tardy for work, only to be reprimanded by the new head of personnel, Winthrop! In order to please his father Winthrop Peaboy Sr. and show him that he’s up for his new job, junior is unusually harsh with Pert. This causes all kinds of confusion and frustration for the young couple. Of course the end of the movie resolves all, but the scenes between Pert and her parents, and the others in between, are both humorous and poignant. It’s easy to see why Moore was such a big star in the silent era. Besides being pretty and attractive, she had a effervescent personality that is hard to resist. Hamilton, Moore’s costar is best known today as Commissioner Gordon from the Batman TV series from the 1960s. Although the film is silent (no dialogue), it is accompanied by a synchronized score and sound effects, something that was fairly common during the transition from silent to talking films. The film boasts early screen appearances of Jean Harlow, Andy Devine, Mischa Auer, Phil Harris, and Grady Sutton, but the only one I really noticed was Harlow in a party scene. Two silents in two days and I enjoyed them both! After Why Be Good? it was a choice between 42n Street (1933) and So Dear To My Heart (1948). It was really no contest. I’ve seen 42n Street and the opportunities to see it on the big screen would come again, but not so with Disney’s So Dear To My Heart. Film critic Leonard Maltin who is a real fan of the film said he hoped he hadn’t “oversold” the movie with his enthusiastic introduction, gave us some backgrond on the film. We learned that the movie had originally been planned as Disney’s first all live-action film, but that the distributor, RKO, didn’t think they could “sell” a Disney film without animation. So some short animation scenes were inserted to appease RKO, even though they add little—other than the fact that they’re cute—to the overall story line. The plot surrounds Jeremiah Kincaid (Bobby Driscoll) and his efforts to raise a black sheep to be a county fair champion, a champion just like race horse Dan Patch, in 1903 Indiana. Jeremiah’s stern, but loving grandmother, Granny Kincaid (Beulah Bondi) is against her grandson raising the black sheep as a pet, but she eventually relents, against her better judgment. Others in the cast include a very young Burl Ives as Uncle Hiram Douglas, singing the Oscar-nominated song, “Lavender Blue” and Luana Patten as Tildy. 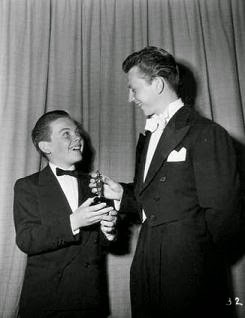 Bobby Driscoll, who also scored a hit in The Window (1949) on loan to RKO won a special juvenile Academy Award for his performances. 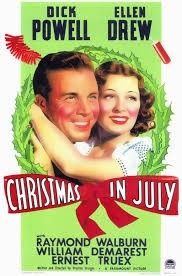 The movie is corny, sentimental, but charming and extremely watchable. I was transported to a simpler time in my life when my older sister would take me to every Disney movie, that was playing in our neighborhood, when I was a young boy. 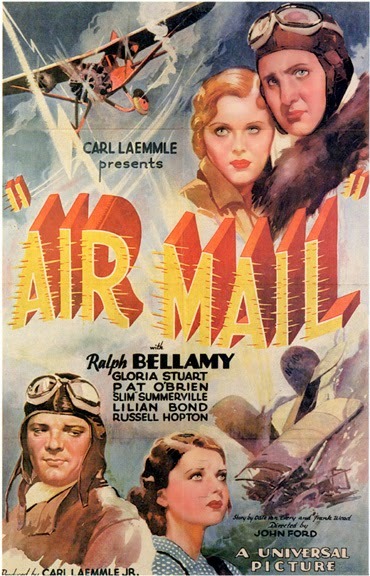 After So Dear To My Heart, it was back on line at the same theater for John Ford’s Air Mail (1932). I never even heard of Air Mail, so I was anxious to see it. Seven years before Howard Hawks’s Only Angels Have Wings, John Ford crafted this exciting film about young pilots transporting the mail under dangerous conditions from a desert airport at the foot of the Rocky Mountains. Leonard Maltin introduced this film as not a classic, but as an entertaining film and early Ford directorial effort and a rare stint working at Universal Studios. Ralph Bellamy as Mike Miller is top-billed over Pat O’Brien (Duke Talbot) and the rest of the cast that also includes Gloria Stewart (Ruth Barnes), Ward Bond (Joe Barnes), and Slim Summerville (Slim McCune). Bellamy plays the level-headed and headstrong operator of the airport who hires hotshot pilot Duke Talbot to take the place of Joe Barnes (Ruth’s brother) who lost his life in a fiery plane crash. For a film shot in 1932, the special effects are fairly impressive. Most impressive are some of the miniature sets of the airport that were remarkably realistic. The real drama begins when Mike, whose eyesight isn’t what it used to be, flies out during some bad weather, against the wishes of his girlfriend Ruth. He crashes in a remote mountain area with little hope of being rescued. Duke who has run off with the widow of another pilot, decides he can rescue Mike. Duke makes the daring attempt to save Mike, successfully landing his plane where Mike is stranded. Duke manages to load Mike into the plane and take off. Although the plane is able to fly, it sustained some damage during its rocky landing. While flying, the plane begins to fall apart. Realizing that he can’t land safely, Duke flips the plane over on purpose, which causes Mike to fall out. Mike lands safely with his parachute. Duke crashes, but survives, making him an instant hero. It was great to see a film where Bellamy was not only the lead, but also the guy who actually gets the girl in the end. Maltin called this a “bread and butter” movie for Ford. Under contract to Fox, which was cutting salaries, Ford decided to go to work for Carl Laemmle Jr. at Universal to pick up some extra cash. Jane Withers charms the crowd. Next it was off to Club TCM for some Hollywood Home Movies. This was a great treat. Guests that shared their home movies included, Jane Withers, Bob Koster (son of director Henry Koster), and Neile Adams McQueen (widow of Steve McQueen). We saw some rare behind the scenes movies of Esther Ralston and Gary Cooper in a silent film that is lost to history, as well as images of Charles Laughton, Elsa Lanchester, and Sophia Loren, during the filming of her first American film, Boy on a Dolphin (1957). Withers was the most fun, however. She narrated her home movies, which included the likes of Jackie Cooper, Roddy McDowell and other child actors of the era. Withers’s enthusiasm and charm was evident throughout and it was a treat just to see her. For some reason (I blame Laura and Kristina) I decided to see Imitation of Life (1959) starring Lana Turner and John Gavin. 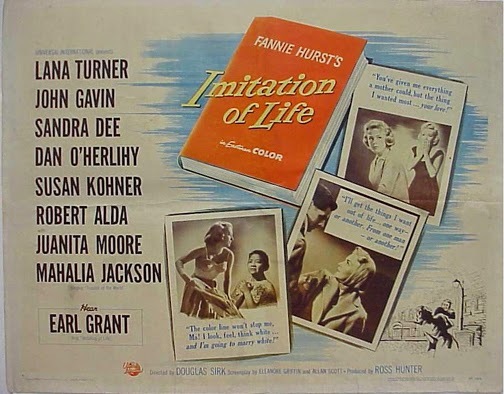 Imitation is a glossy melodrama produced by Ross Hunter and directed by Douglas Sirk. Introduced by Sherry Lansing and Leonard Maltin, who both think the film is worth seeing and a film that resonated with Lansing when she first saw it at age 14. For me though, the film was almost a parody. The melodrama and acting style was over the top and it just didn’t work for me. After not getting into Too Late for Tears, watching this film was one of the few things I regret about the festival. I would have much rather enjoyed seeing Adam’s Rib or The French Connection, but that’s the way it goes; we have to make choices and sometimes we’re not happy with them. Five films in one day was a record for me. I was exahausted and my eyes were sore and dry from all that movie-watching. On Sunday, my day started a little later than Saturday with my favorite movie experience of the festival: Calamity Jane (1953). Check back for my last update, to be followed by a wrap-up, and some hints for first-time festival goers.